Respect the Water! It’s a familiar maxim to those living near the coast. The RNLI (Royal National Lifeboat Institute) stickers and posters adorn every door and window in our community. Every winter in Cornwall, though, the water demands just that bit more respect than ever! Seeing a great Atlantic Storm give us its all is one of the most special awe inspiring sights you can get. White water hitting the coast with the force of several atom bombs. Spray reaching far inland and drying on the windows of your hotel or car. Seaweed stranded far up shore beyond its usual tide mark. The wind drowning out the squeals of delight of kids and adults alike. In early 2018 Storm Eleanor was a marvellous case in point. 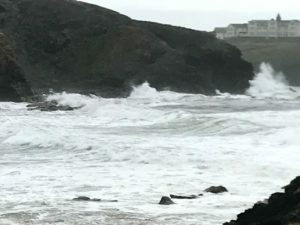 Here Perranporth, where Poldark’s Cornwall is based and the former home of Winston Graham himself, an enormous sand cliff was created by the storm in the middle of the beach. The raw power shifted tonnes of sand to create whole new landscapes. New “sand cliffs” have developed along the coast of north Cornwall, causing one beach to be closed by the council. Come and watch some of winter’s finest weather with us. Winter in Cornwall. Rarely cold, and always with a warm welcome.